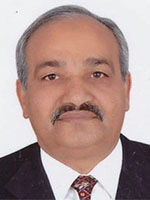 Batu Krishna Uprety is an Expert Member of the Climate Change Council and Former Head of the Climate Change Management Division in Nepal's Ministry of Environment, where he was involved from 1983 to 2007 in institutionalizing the environmental impact assessment (EIA) system. After completing an MSc in Botany in 1980, he taught plant ecology for BSc and MSc programmes at Tribhuvan University, Nepal. He has served as the Least Developed Countries Expert Group (LEG) Chair since February 2014. From 2007 to 2012, Mr Uprety was involved in preparing Nepal's NAPA, LAPA, and Climate Change Policy, initiating the preparation of SNC, TNA, PPCR and SREP and developing NAPA prioritized projects. He was also engaged in establishing coordination mechanisms and a core negotiating team on climate change and facilitating mountain initiatives on climate change. He has published several popular articles on environmental conservation, biodiversity, EIA, and climate change in national newspapers. Key recent publications include: Climate change negotiation: understanding the process; Climate change and challenges to human security; Climate adaptation: a survival strategy for mountain people; and Climate screening, adaptation actions, financing and policies: essentials for improving the livelihoods of the poor. Mr Uprety has published two books (EIA: Process and Practice and Environmental Conservation and Sustainable Development) and prepared proceedings on climate change and the UNFCCC negotiation process and mainstreaming climate change into mountain development in 2012. In 2005, he received the Science and Technology Talent Award from the National Academy of Science and Technology of Nepal.